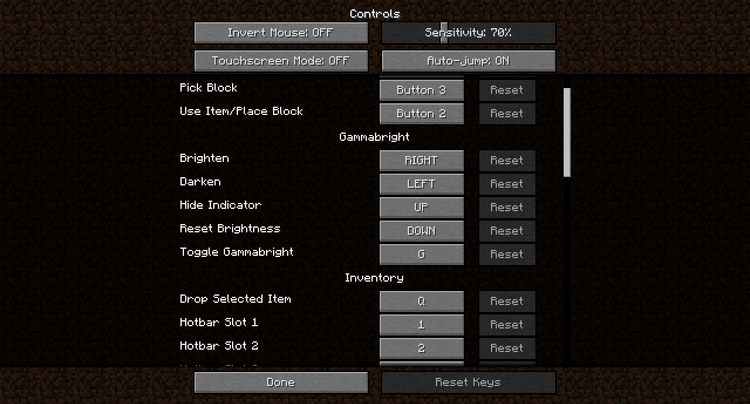 Gammabright Mod 1.12.2/1.11.2 has supported the ability of light customization of the darkness in Minecraft. It also helps the players to see through some dark areas or under the water. The bright in Minecraft game basically is a minus point. When being in some locations in the world, the bright is not suitable, some needs darkness but does not, some do not need to be dark, but we cannot see anything. To solve that problem, Gammabright Mod written and experienced in several areas: caves, under the water or simply on the land in the night and the result is quite excellent. Turn on/off by one button. Edit the light with the percentage in the display menu. Customize the brightness point quickly by some arrow buttons. Use file config to change the configuration. See clearly in the caves, stones, or under the water. Easily discover the enemies in the darkness, avoiding to be attacked suddenly. Customize the suitable and quick brightness when filming the video. G: On/Off (default brightness is 1500%). Hold Shift (wandering) and press G one more time to display the current brightness instead of turning on/off. A right arrow: Increase 10% light (hold shift to increase 20% for every press). A left arrow: Decrease 10% light (hold shift to decrease 20% for every press). A Down arrow: Reset the default brightness. An Up arrow: Display current brightness (hold shift and then press to show forever). Note that, from above 1.7.2 version; it only supports LiteLoader to enhance the stability. Put Gammabright.litemod file into mods version folder and then run Minecraft. Done!